The Pittsburgh Steelers were unable to capitalize on the momentum established after beating the Patriots last week as they dropped tonight’s game against the Saints, 31-28. You can argue all you want about poor officiating, but the officials had nothing to do with the poor execution that left the Steelers anywhere between a couple inches and a whole yard away from making a pivotal play when it mattered most. The first example of this comes on a fourth-and-five from Pittsburgh’s 42-yard line. The Steelers faked the punt and instead snapped the ball to fullback Roosevelt Nix. He made it all of four yards before Craig Robertson and Chris Banjo brought him down about a yard short of the first down marker, giving New Orleans excellent field position to start its drive. Sadly for Nix, he didn’t realize he was short of the marker until he got over to the sideline and proceeded to celebrate as if he got his team a new set of downs. The next moment came on the Saints’ ensuing drive. Drew Brees got the offense down to the two-yard line and threw a pass to Michael Thomas near the front corner of the end zone. The play was initially ruled as a one-yard pass and it looked like Steelers corner Joe Haden, who committed pass interference a few plays earlier, had redeemed himself and saved a touchdown. But, the call was later reversed upon further review to be a touchdown because Thomas had possession of the ball across the goal line. In a flash, Haden had gone from having mild redemption, to coming up just short. But the Saints made a potentially fatal error: they scored with a fair amount of time on the clock for Ben Roethlisberger and a talented Steelers offense to, at the very least, tie the game late. Roethlisberger got his team to the 42-yard line where he threw a pass to JuJu Smith-Schuster, who promised his fantasy football owners on Saturday that he’d play tonight and wouldn’t let them down. So what does he do when after catching the ball and getting tackled on the field goal target line graphic? He fumbles the ball. 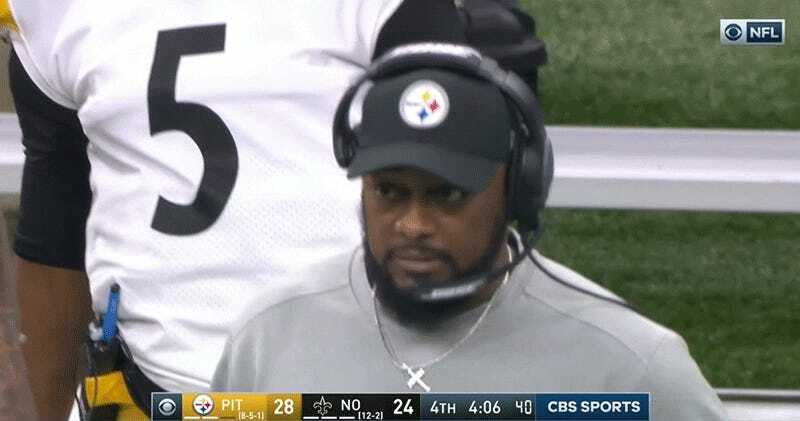 Had his knee been just mere inches closer to the ground to make contact with it, the Steelers would have really had the Saints on their heels and might have been able to use that momentum not just settle for the tie, but go for a game-winning touchdown. They would have clinched the division, and wouldn’t need to rely on the goddamn Browns to keep their playoff hopes alive. Instead, they came up just short.